In October 2015, at the Oceania Tobacco Control Conference, Professor Mike Daube, one of Australia’s best-known public health advocates, gave the closing address. 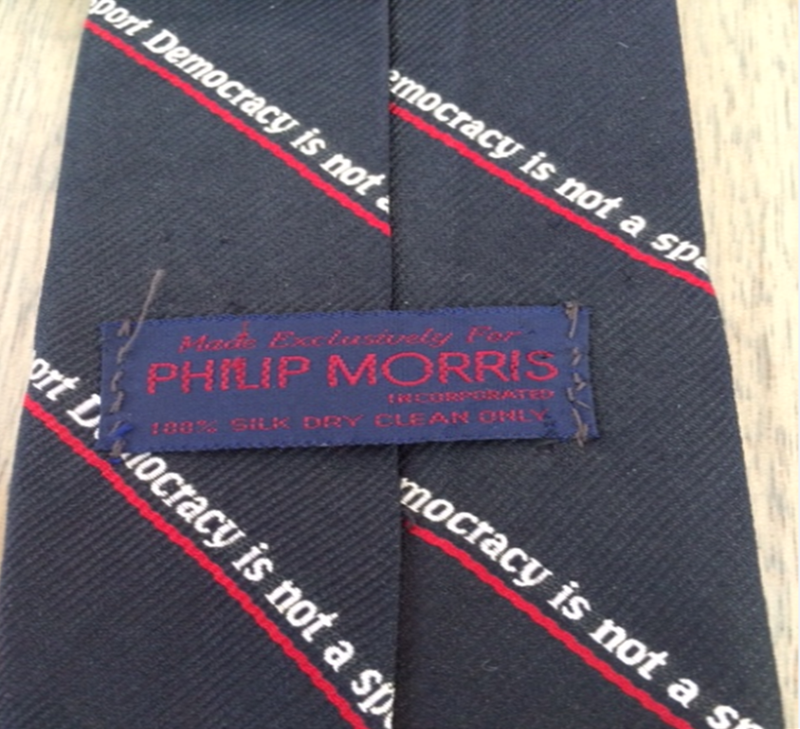 He wore a tie given to him some years ago by an American colleague. It read: “Democracy is not a spectator sport”. On the back were the words: “Made exclusively for Philip Morris”. 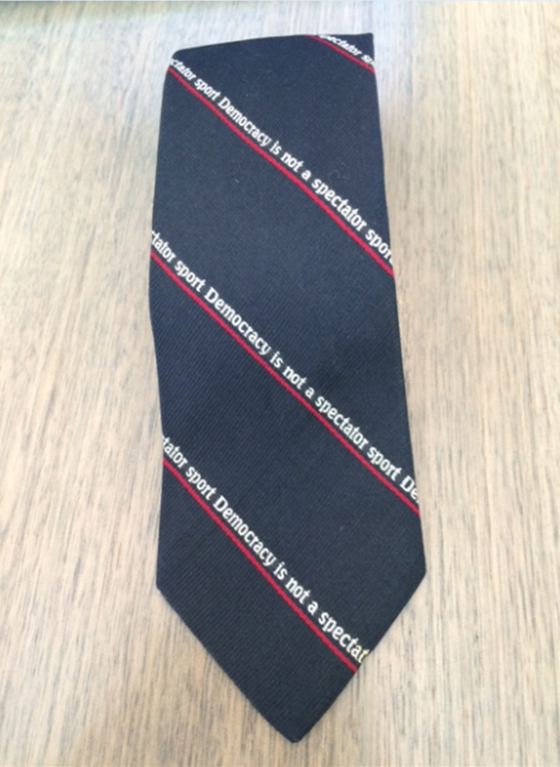 The tie had been sent to all member of Congress. RM: But is that what a political donation buys? 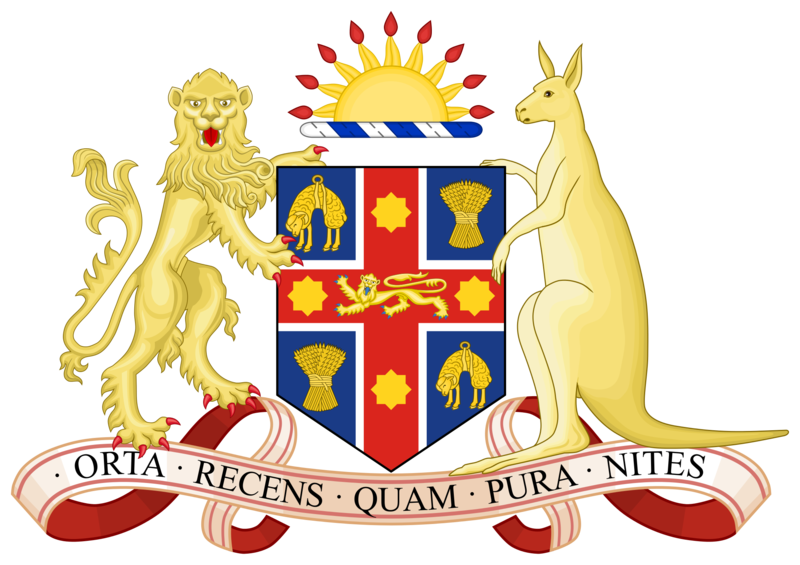 In Australia, the High Court has ruled that freedom of political communication on matters of politics and government is implied by the Australian Constitution and is “an indispensable incident of the system of representative government for which the Constitution provides”. But should this freedom translate into a right for tobacco, alcohol, gambling, and other corporations to make large donations to political parties in order to strengthen alliances and to influence political and policy processes? If the capacity to make political donations acts as a social lubricant which facilitates access and relationship building, where should the line be drawn in denying access to certain industries? As noted in a previous post, in McCloy v New South Wales  HCA 34 (7 October 2015), the High Court considered the constitutional validity of provisions of the Election Funding, Expenditure and Disclosures Act 1981 (NSW), which impose caps on political donations and electoral communications expenditures. The same Act prohibits property developers, tobacco industry business entities, and liquor or gambling industry business entities from making political donations at all. In McCloy, a property developer argued that the freedom to “build and assert political power”, by making substantial political donations with the intention of achieving access to politicians, was an aspect of the implied freedom of political and government communication. 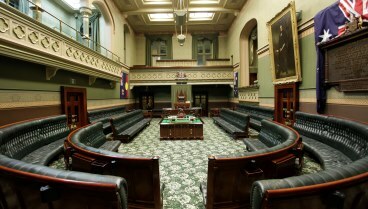 The plaintiff argued that as a result, the caps on political donations imposed by the Election Funding, Expenditure and Disclosures Act 1981 (NSW) (ss 95A-95B) were inconsistent with the Constitution and therefore invalid. This post briefly summarises key aspects of the reasoning adopted by French CJ, Kiefel, Bell and Keane JJ, who joined in the majority judgment. In an earlier case which had considered a different section of NSW’s Election Funding Act, five Justices of the High Court reaffirmed that, unlike the First Amendment to the United States Constitution, the implied freedom of political communication is not a personal right which restricts legislative power in accordance with the measure of a constitutionally protected individual freedom of persons to express themselves. In Unions NSW the High Court accepted that the freedom of political communication protects the discussion of political and government matters at federal, state and local levels (Unions NSW ). In McCloy, the majority summarised the approach that the Court takes when it considers the validity of legislation – in this case NSW’s Election Funding Act. The first question is to consider whether the specific provision in dispute “effectively burdens the freedom of political communication either in its terms, operation or effect” (Unions NSW ). The High Court accepted that irrespective of the legitimacy of the purpose of the Election Funding Act, the provisions in dispute did effectively burden the implied freedom of communication because they reduced the funding available to political parties and candidates (Unions NSW ; McCloy ). Given this conclusion, the next question was whether the provisions of the Act that were in dispute were proportionate or served a legitimate purpose in a way that was compatible with the system of representative government prescribed in the Constitution ([Unions NSW ). Identifying whether legislative provisions serve a legitimate purpose requires the court to identify the statutory purpose(s) that the relevant provisions seek to achieve (McCloy ). The majority accepted that the caps on political donations were intended to prevent corruption and undue influence within the government of the state. They were also directed to overcoming perceptions of corruption and undue influence, which could in turn undermine public confidence in government (McCloy -). The majority accepted that large political donations by wealthy donors may dominate the flow of political communication, drowning out other voices and undermining “equality of opportunity to participate in the exercise of political sovereignty” (McCloy ). In their majority judgment, French CJ, and Kiefel, Bell and Keane JJ pointed out that the capping of political donations was not only compatible with the system of representative government established by Australia’s constitution, but preserved and enhanced it . The Election Funding Act also prohibited donations by property developers, tobacco, alcohol and gambling business entities. Pointing to no fewer than 8 reports about corruption in the planning process published by the NSW Independent Commission Against Corruption (ICAC) and other bodies, the majority accepted that planning decisions may involve the risk of undue or corrupt influence that is “greater than in other areas of official decision-making”. The prohibition on donations from property developers was upheld as being directed to a legitimate purpose. The majority went on to consider whether there were “alternative, reasonably practical means” of achieving the legitimate purpose of reducing the risk of corruption and undue influence, by means other than the capping provisions and the prohibited donor provisions. This step is required because any restriction of the implied freedom of political communication must be justified (McCloy ). whether the effect of the legislative provision on the freedom is “undue”. This third step necessarily involves a value judgment: the court must weigh the “public importance of the purpose sought to be achieved” . The greater the restriction on the implied freedom of political communication, the “more important the public interest purpose of the legislation must be [in order] for the law to be proportionate” . In this case, the majority recognised the public interest in removing both the risk of corruption, and perceptions of corruption. On the other hand, the caps on political donations, and the prohibitions on political donations by certain entities did not prevent people from seeking access to politicians or from communicating with others about matters of politics and government. For these reasons, the majority upheld the constitutional validity of the “capping” and “prohibited donor” provisions in the Election Funding Act. This bodes well for any potential challenge to legislation prohibiting donations from alcohol, tobacco and gambling business entities. The Unions NSW and McCloy cases confirm that the power that companies and business associations might seek to exercise over the political process in Australia is not unchecked. Corporations do not have rights of commercial speech that are protected by the Constitution. The Australian Constitution protects freedom of political communication, but it does not protect the specific commercial interests of particular companies in having their voices heard, including through advertising. Secondly, neither corporations nor individuals have personal rights “to communicate” about regulatory matters relating to their business in the sense that legislation infringing those rights will be invalidated. Rather, the question will be whether legislation enacted by Parliament is invalid because it “effectively burdens the freedom of political communication either in its terms, operation or effect” (Unions NSW ). Even when it does, such legislation will be upheld when it is proportionate or serves a legitimate purpose such that it is compatible with the system of representative government prescribed in the Constitution ([Unions NSW ). Enjoying the Australian election? Of course you aren’t. But campaign finance and political donations are a neglected public health issue. “Is it absolutely irrelevant? No. 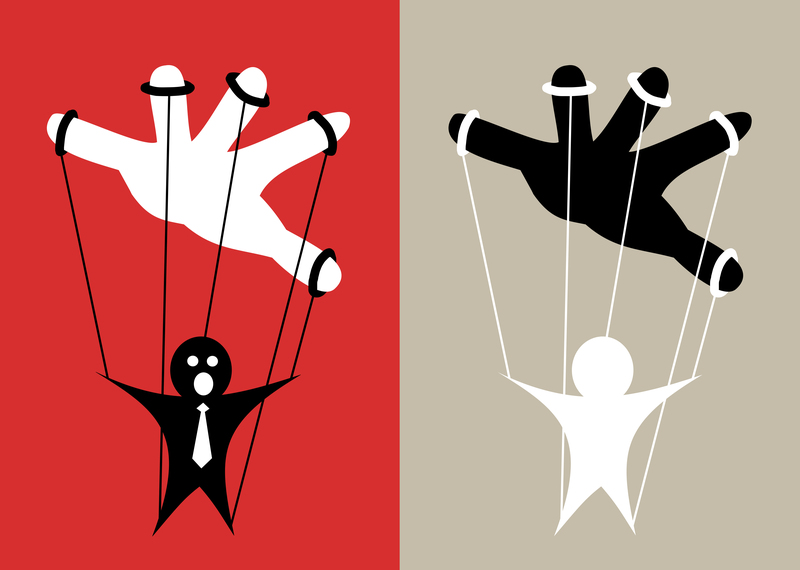 The truth is, government departments see stakeholders. [I]f we gave no money or if we gave $1 million to whatever the party is that happens to be in power, the Health Department will accept our submissions about the latest packaging restriction or whatever. Will it take more notice of us because we give them $1 million? I think the answer is clearly no….people are aware it’s such a small amount of money”. This kind of politicking raises an important question. Why should industries that harm and destroy health have privileged access to politicians and greater influence on public policies – simply because they have more money? This post briefly reviews restrictions on political donations under NSW law. Under Commonwealth law, there is no limit for donations to political parties and candidates for political office, although donors must disclose donations above the disclosure threshold (currently $13,000 for the year to 30 June 2016) to the Australian Electoral Office (Electoral Act 1918 (Cth) ss 305A-305B). In New South Wales, on the other hand, Part 6 of the Election Funding, Expenditure and Disclosures Act 1981 imposes restrictions on political donations and electoral expenditure. The purpose of these restrictions is to “prevent corruption and undue influence in the government of the State” (s 4A). Except where specified, the Act extends to both State and local government elections. There are 5 main restrictions. Firstly, the Act requires the disclosure of “reportable” political donations and electoral expenditures (as defined) to the NSW Electoral Commission (ss 86-87, 92-93). The Commission is required to make these disclosures publicly available on its website (s 95). Secondly, the Election Funding Act imposes caps on political donations (ss 95A-95B) and on “electoral communication expenditures” during the run-up to State elections. This is known as the “capped expenditure period” (ss 95F, 95H-95I). For the year ending 30 June 2016, political donations to a registered political party are limited to $5,800, and $2,500 for an elected member or political candidate. Current caps on electoral communications expenditure are shown here. However, the restrictions on political donations do not apply to gifts intended for private use by a Member of Parliament (s 85(4)), nor does the cap apply to expenditure by a wealthy politician or candidate on their own campaign. Although caps on political donations and electoral communications expenditures affect the finances of election campaigns, this is offset by Part 5 of the Act, which regulates public funding of NSW election campaigns. Thirdly, in addition to caps on political donations and electoral communication expenditure, the Act prohibits a range of “indirect campaign contributions” (s. 96E). These include the provision of office accommodation, computers or other equipment which are to be used substantially or wholly for election campaign purposes. It also includes the waiving of payment for electoral advertising expenditure, although this does not apply to the provision of voluntary labour. Fourthly, in order to remove perceptions that foreign political donors can unduly influence the political process, the Election Funding Act states that political donations can only be accepted from individuals enrolled to vote in the State, or from corporate entities that are either registered to operate a business in Australia or who have an executive officer living in Australia (s 96D). Finally, the Act prohibits certain donors from contributing to a candidate, politician, or political party at all. Prohibited donors include: a “property developer”, a “tobacco industry business entity”, a “liquor or gambling industry business entity”, or an industry association representing the donors listed above. The definition of prohibited donors include “close associates”, including company officers, related bodies corporate, and significant shareholders of property developer, tobacco, liquor and gambling companies (s 96GAA, 96GB). It is unlawful for a prohibited donor to make a political donation in NSW (s 96GA). In McCloy v New South Wales  HCA 34 (7 October 2015), a property developer challenged the constitutional validity of those provisions of the Election Funding Act that prevent property developers from making contributions in excess of the cap to a political party. The plaintiffs included a property development corporation, and a director and close associate of such a company who argued that the ability to make substantial political donations in order to gain access to politicians is an aspect of Australia’s implied constitutional freedom of political communication. Six of the seven justices concluded that the caps on political donations, and the prohibited donor provisions were not invalid by virtue of infringing the implied freedom of communication on government and political matters that is recognised by the Commonwealth Constitution. This case has interesting implications for political spending by corporations whose business activities come at a cost to public health. The McCloy case will be discussed in a later post.